I haven’t been to Panera in a long time. A really long time. Until recently. And I noticed their menu has changed quite a bit. They seem to have a bit more global flavors than I remember, and I really like the change! Granted, they aren’t too far out there, as I can understand they want to continue to appeal to the general public, but some new fun items none the less. The Thai Garden Chicken Wonton Broth Bowl (not sure why it just can’t be called soup) really caught my eye. And, I loved it! And of course, I thought how hard could it be to make it at home? The hardest part of this broth bowl was making the wontons. And really, it wasn’t hard at all, it was just really tedious. The recipe called for a pound of ground chicken, but seeing as though a little goes a long way, I only used 1/2 pound, and it still made about 25 wontons. Another great option is to use frozen pre-made wontons. Costco actually has some pretty good chicken wontons. Because I made a large pot for just the two of us, the only thing I would have done differently next time is add only the wontons I intend to eat that day. The wonton wrapper itself started to fall apart by day 3 from sitting in the liquid so long. I would keep the others uncooked and wrapped up to throw in when I heat up the soup. Overall, I really liked it. Nate was kind enough to let me know that I can make that any time I want…meaning he really liked it, too! 1. In a medium bowl, combine ground chicken, onion, 2 cloves minced garlic, Ponzu, sesame oil, 2 tsp ginger, and vinegar. Scoop one tablespoon of chicken mixture on wonton wrapper. Seal edges with water and set aside. 2. In large soup pot or Dutch oven, bring chicken broth and water to a boil. Add carrots and continue to boil for 3-5 minutes. 3. Lightly sauté 2 tbsp. ginger, remaining garlic and add mushrooms, about 5 minutes until mushrooms are soft and fragrant. Add mushrooms, broccoli, miso and sweet chili sauce. After simmering 10 minutes, add green onion, cabbage and wontons. Cook wontons until chicken is cooked through, about 4 minutes. Serve and garnish with sesame seeds. Do you ever feel overwhelmed with the amount of odds and ends in your refrigerator that are on the edge of going bad? Maybe ‘overwhelmed’ isn’t the correct word – terrified seems more like it. At least for me. I hate wasting, and I despise throwing food away because I’ve let it go bad. In fact, it even irks me when other people let food go bad and have to throw it away. I know, this is a bit of an issue. But, there are starving kids in …. well, you know. Don’t get me wrong, if it has gone bad, throw it out. But, my point is that you should be aware of what you’ve got and what needs to be used up before meeting it’s demise. I truly just threw this salad together one day with a ton of leftover stuff in my fridge (cooked quinoa, shredded chicken and shredded cabbage), and it was so good, I had to re-create it and share it with you. This is a fantastic, healthy, fresh salad. It is packed with flavor, it’s quick, and is a perfect weekday lunch! It’d even be great to bring camping, on a picnic, or even to a potluck. Bonus, it’s gluten-free! Don’t have these leftovers in your fridge, it’s okay, you could use rice or couscous instead of quinoa (of course, these alternates aren’t GF); turkey or beans instead of chicken; and broccoli slaw, arugula or spinach instead of cabbage. Get creative! What has been your favorite recipe you’ve made with leftovers? 1. 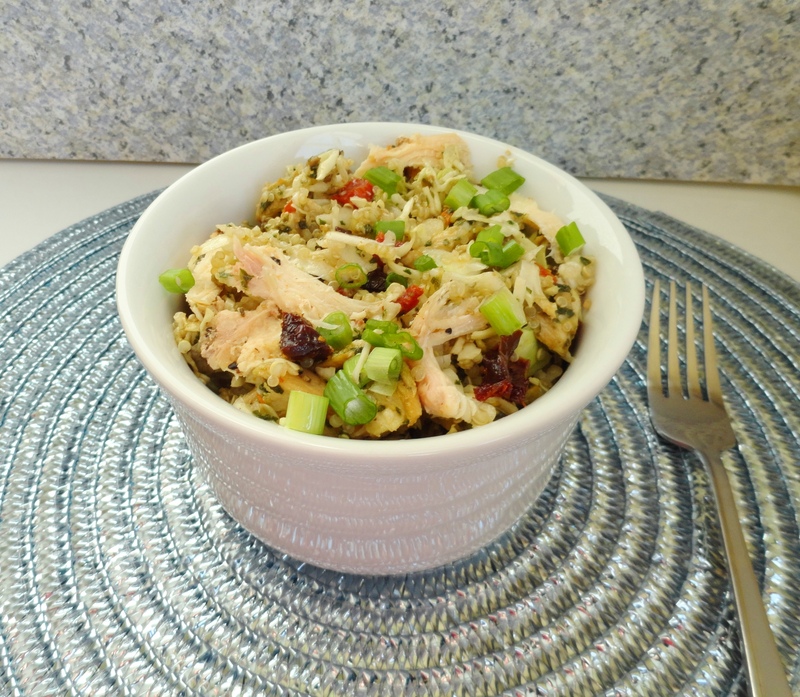 In a medium bowl, mix together quinoa, chicken, cabbage and sun-dried tomatoes. Stir in pesto until evenly coated. 2. In a small bowl, whisk together vinegar and olive oil. Pour over salad a little at a time until coated as desired. Season with salt and pepper to taste. Garnish with green onions. 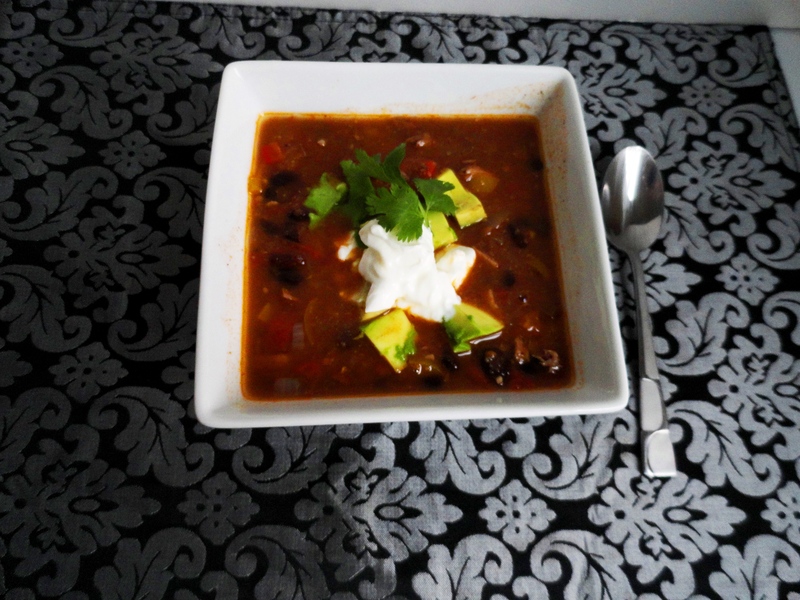 I love soup, and chicken tortilla soup is one of the best! 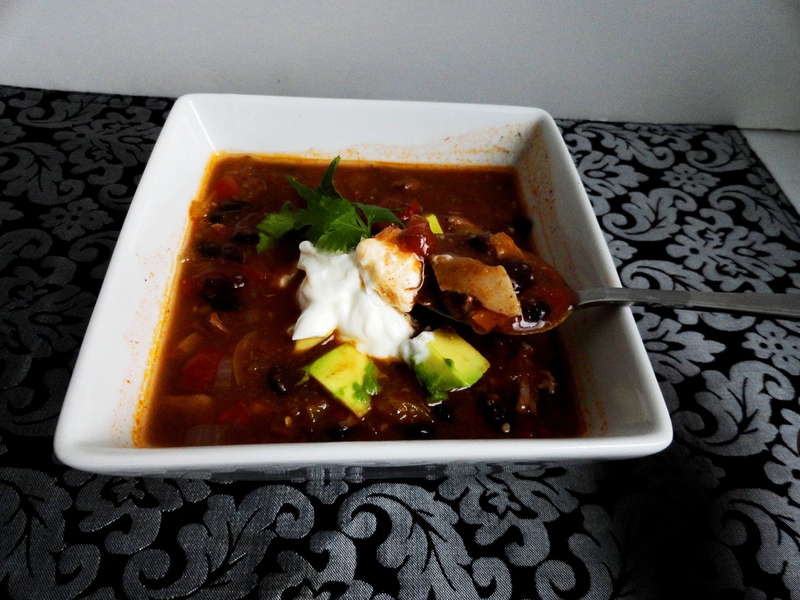 This is the perfect time of year to make soup, and as I had just made a whole chicken the day before (rustic roasted chicken), I had the perfect opportunity not only to make chicken tortilla soup, but also to make my own stock for the soup. 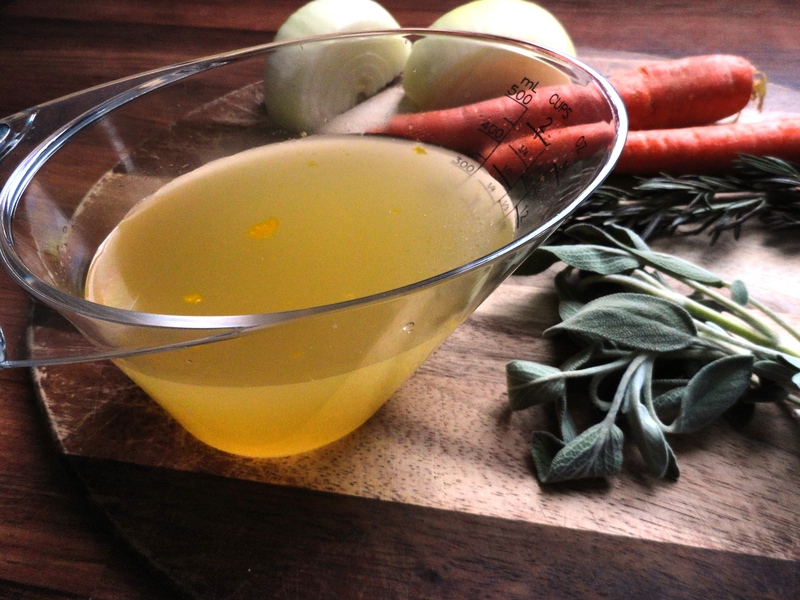 No worries if you don’t have your own homemade stock, store bought chicken broth or stock will do just fine. And if your wondering what the difference is, or how to make your own, see my earlier post from this week. This soup was soooo good. While still working on his first bowl, Nate asked me if there was more. I said he had to work on what he had in front of him, then he can think about seconds (sometimes I feel like a mother, though I have no actual children). And he did. And he devoured it all. I loved the addition of the cornmeal to this soup, not only adding a little more heft, but also a slightly sweet corn flavor. As always, adjust the vegetables to what you have in your kitchen – I used frozen bell peppers I had leftover from our wedding reception. Also, adjust the heat to your liking. The original recipe doesn’t call for any chilis, but I have a ton frozen from my garden over the summer, and threw in two jalapeno and one Serrano pepper. It added a great amount of heat, without over powering the flavor of the soup. 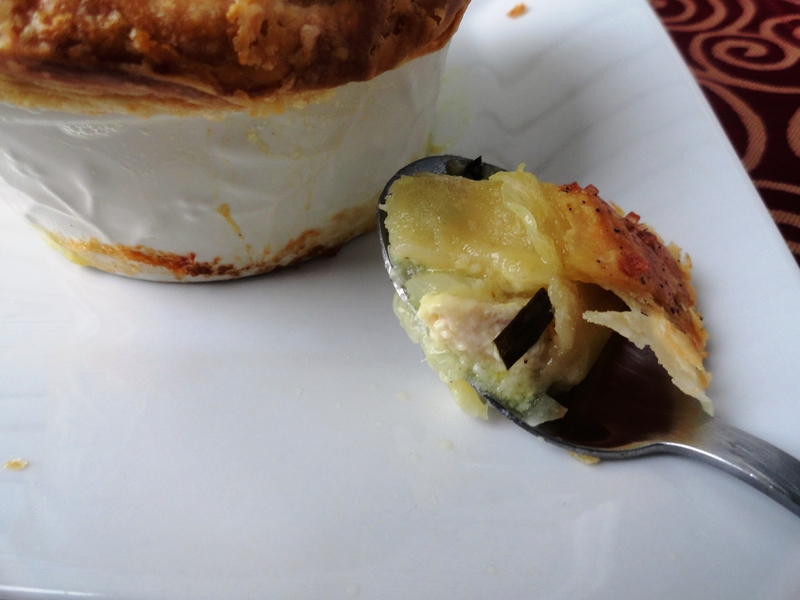 This is an excellent wintertime comfort food and would be fantastic for entertaining. Just set up a bunch of accoutrements for everyone to make their own creation! 1. Heat one tbsp olive oil over medium high heat. Add onions, peppers and garlic and cook until they begin to soften, about 3 minutes. Add chicken, cumin, garlic powder, chili powder, crushed red pepper and salt. Cook until spices become fragrant, about 2 minutes. 2. Add tomatoes, chicken broth, tomato paste, water and black beans. Bring to a boil, then reduce heat to low. Simmer for 45 minutes uncovered. 3. Mix cornmeal with a small amount of water, then pour into soup. Simmer for 30 minutes longer. Check seasonings and adjust to taste. Turn of heat and allow to sit for 15-20 minutes. 5 minutes before serving, add tortilla strips. Serve and garnish as desired (avocado, cilantro, cheese, onions, sour cream, etc.). 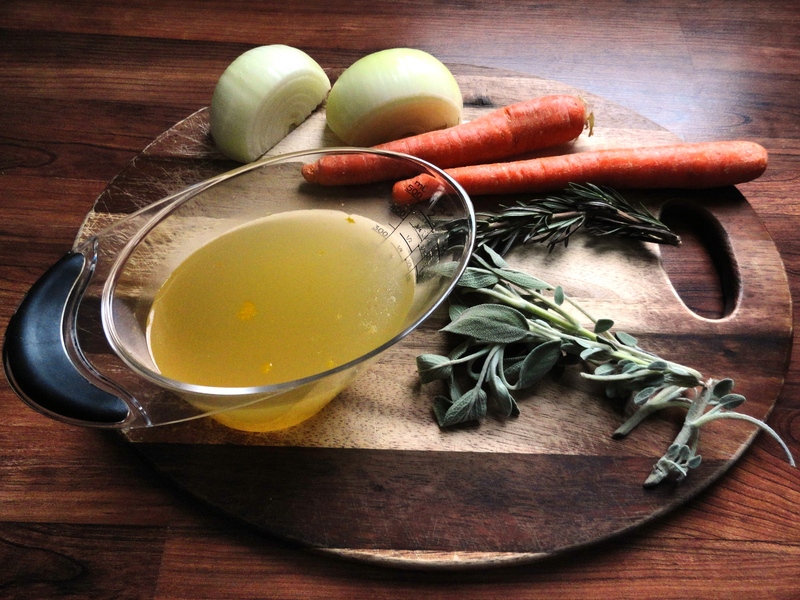 Have you ever wondered what the difference is between broth and stock? Me too! To be completely honest, I have always used them interchangeably, knowing that they must be different on some level. But, I haven’t had any catastrophes yet, so I figured there’d be no harm in continuing my old ways. 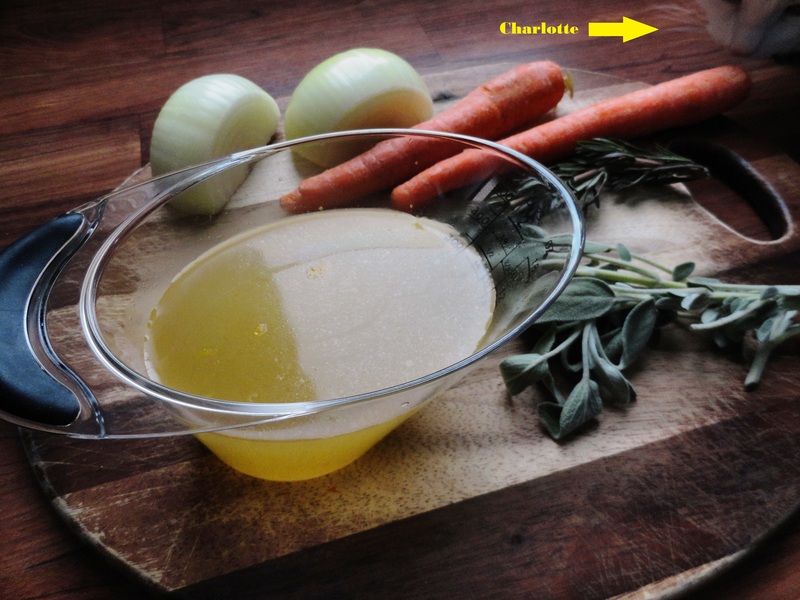 However, when I decided to make my own stock (or is it broth?) and share with you, I thought I should actually do a little research. Turns out, there is a slight difference. Stocks are generally made with the bones and trimmings, while broth is made with the meat as well. Stocks simmer for much longer and are said to have a deeper, richer flavor because of the gelatin released from the long simmering bones. While they are technically different, they are quite similar. I say, keep on substituting stock for broth, or broth for stock. Who cares?! 😛 Just don’t ask me the difference between vegetable stock and broth! 1. Place all ingredients in large pot and cover with water. Bring to a boil, then reduce heat and simmer for 2 hours. Remove from heat and refrigerate for at least 1 hour, but can be overnight. Skim fat from top and use as desired. It’s a great time of year to roast up a chicken, and the best part is all the leftovers you have. Ohhh the possibilities with leftover roasted chicken. Later this week, I’ll share a recipe to make your very own chicken stock and share an amazing chicken tortilla soup recipe. But first, we have to get back to the bird itself. I happened to see this recipe on the Today Show one morning before I left the house for the gym. I thought this would be easy to make, and the only thing I’m missing is the chicken. I rarely buy parsley, but had it on hand for another recipe, and usually it just goes bad because I forget about it and I’d prefer to use cilantro in most cases. I also had the fresh thyme on hand, so I figured it was a sign that I should make this chicken that night. And I did. I even tried to make it early enough so that there was still sunlight left for me to get a good picture. I guess I miscalculated how early the sun sets this time of year. Anyone else think its depressing? Good picture or not, the chicken was so easy to make and super delicious. The rub got nice and crisp and the meat was juicy and packed with flavor. I really don’t know why I don’t make whole chickens more often; they are so inexpensive, especially when on sale – at my local store, 79 cents per pound! Even better, your house smells amazing while this is in the oven! 1. In a food processor, combine olive oil, mustard, 2 tbsp thyme, 2 tbsp parsley, garlic, salt and pepper. Process until well combined. 2. Rinse chicken, inside and out and pat dry. Season generously with salt and pepper. Place lemon halves, garlic cloves, parsley and thyme inside body cavity. 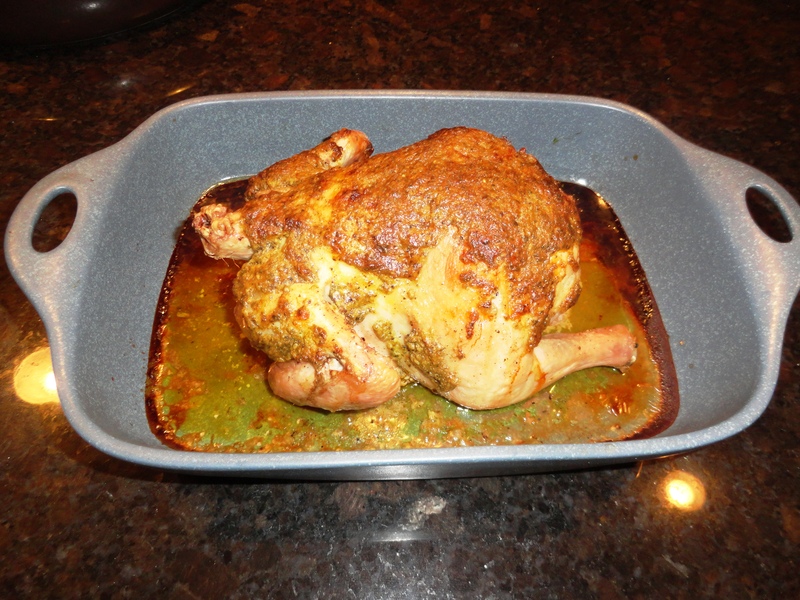 Place chicken in roasting pan. 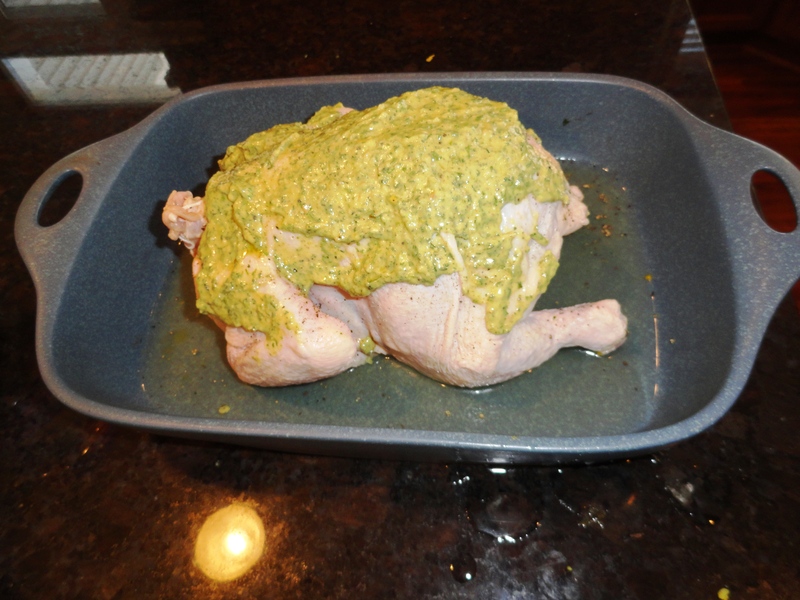 Pour rub on top of chicken, spreading to coat top half evenly. Pour chicken broth around the chicken in the pan. 3. Roast chicken for 80-100 minutes, until internal temperature of the chicken is 165 degrees and the chicken juices run clear when pierced by a fork. Let chicken rest for 10 minutes before carving. 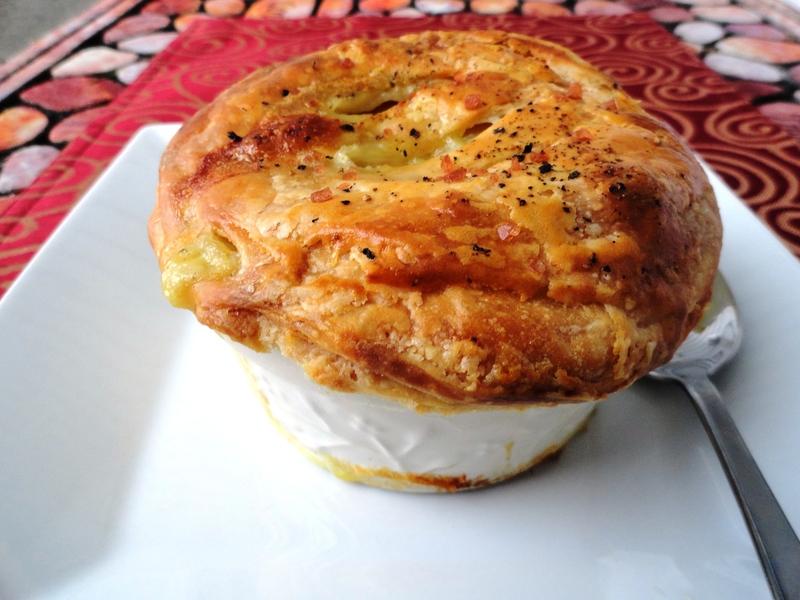 I’ve never done a throwback Thursday, but seeing as though I just re-made a double batch of these delicious pot pies (and took way better pictures than the first time), I thought I’d share it again. I found these great pot pie sized disposable foil baking dishes, which makes these easy to make a bunch for winter and freeze. When you’re ready to eat, just pop in the oven and cook 20-25 minutes longer than freshly made pies. This is the ultimate comfort food for the cold-weather season! What’s your favorite wintertime comfort food?? 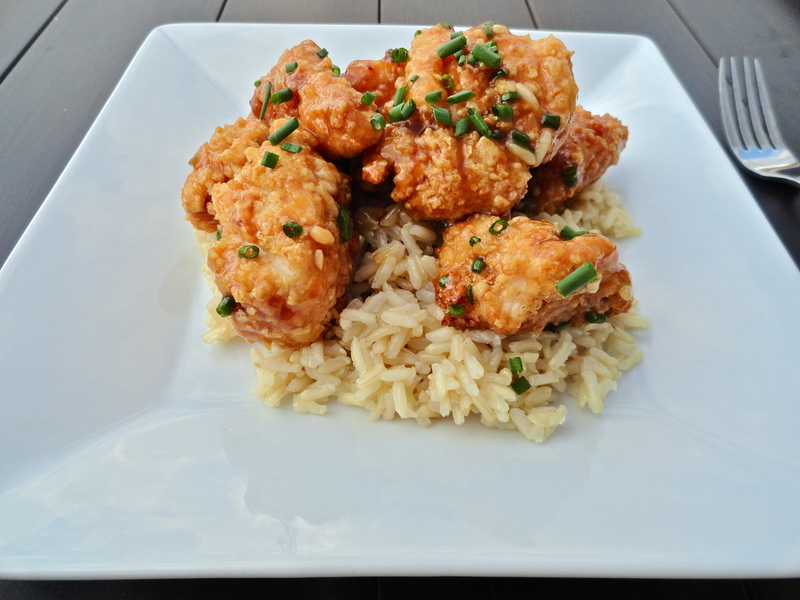 General Tso’s Chicken – Lightened up! Don’t you hate it when you are looking forward to a bowl of cereal in the morning, only to find your sig other had finished off the milk without alerting you or purchasing more? Sadly, this happens to me quite frequently. Sometimes Nate makes his protien shakes with water, and sometimes he makes them with milk. Of course, when I am expecting to have a bowl of cereal in the morning, that happens to be the day that he uses up the rest of the milk for his shakes. But, when we don’t have cereal, but still have a half-gallon of milk left, he chooses this time to use water. I will never understand. 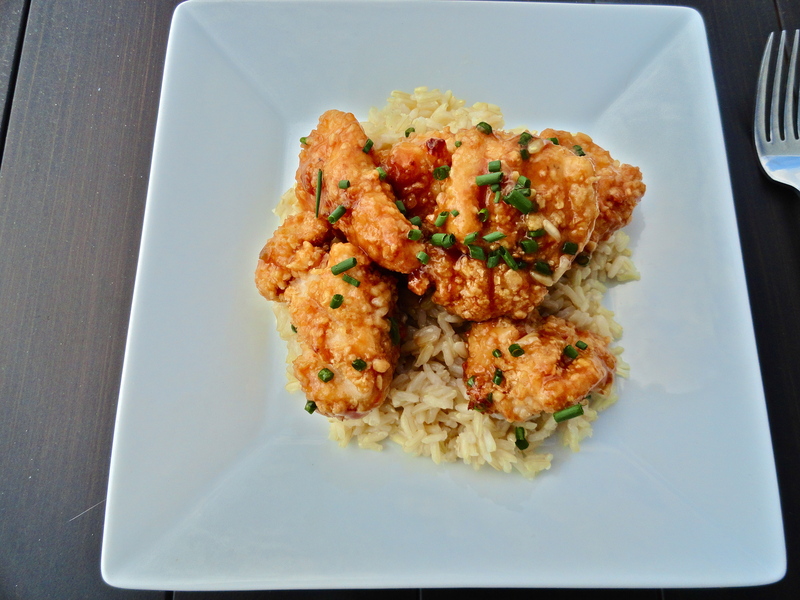 The most recent time this happened, I had left over Special K. I remembered that I had this General Tso’s Chicken recipe made with corn flakes, and decided Special K would be an easy swap for Corn Flakes. Mind you, this is the regular Special K, not any special flavor with the red berries or yogurt or anything of that sort. That would probably be weird. The chicken is breaded and baked, and it stays nice and crispy after coating it with this yummy sauce. I didn’t add any extra heat to the sauce, but you better believe that I added Sriracha to my plate! I could have easily added veggies to this dish, but I’m embarrassed to say, I didn’t have any on hand, so this was an easy go to! Don’t be afraid to step outside your box when you’re in a pinch. You might find something you like, or even love! 1. Preheat oven to 475 degrees. Line a baking sheet with foil, and place a wire rack on top, and spray with olive oil. Set aside. 2. Pulse cereal until fine and pour into shallow dish. Whisk egg whites in another shallow dish. Add flour to gallon size zip-top bag. Pat chicken dry with paper towels and season with salt and pepper. Add chicken to bag with flour, close, and shake until all chicken is coated evenly with flour. Piece by piece, remove chicken, shaking off any excess flour, dip in egg whites, then into crushed cereal, then place on wire rack. Spray with olive oil and bake until golden brown and cooked through, about 12-15 minutes. 3. Meanwhile, make the sauce. In a small bowl, whisk water, soy sauce, apricot jam, hoisin, cornstarch and vinegar together. Heat olive oil over medium heat in small sauce pan. Add garlic, ginger and red pepper flakes and cook until fragrant, about one minute. Whisk in soy sauce mixture, bring to a boil, then reduce heat to low. Simmer until sauce thickens, about two minutes. Remove from heat and cover to keep warm. 4. Once chicken is cooked, place in a large bowl, and toss with desired amount of sauce. Unless you like it really saucy, you probably won’t use it all. 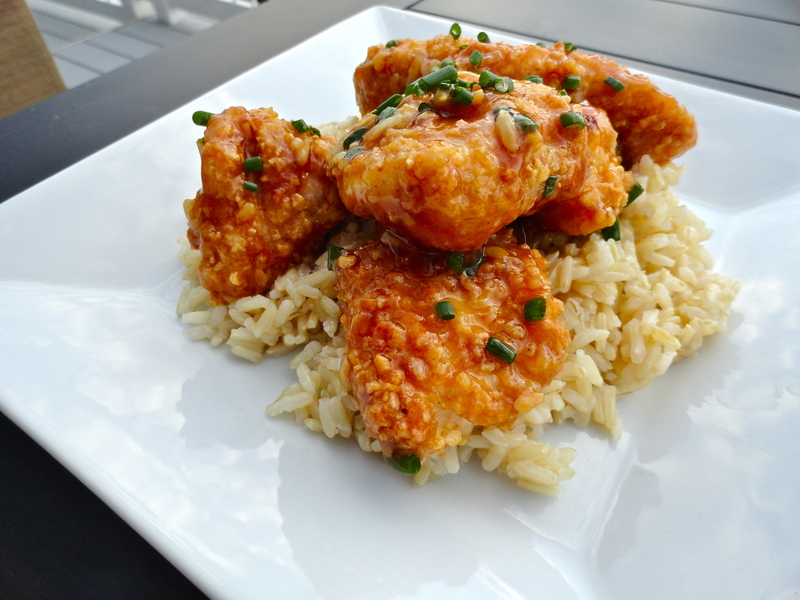 Serve over rice and garnish with green onion or chives if desired.